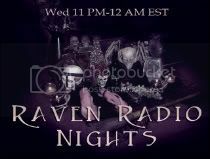 Raven Radio, as mentioned in Romantic Times Magazine, is moving to nights! Tune in every Wed at 11-12 PM EST and join Authors Michelle Pillow and Mandy Roth as they talk about everything, nothing and the paranormal. Guests include NY Times and USA Today Bestselling authors as well as those wonderfully talented authors soon to be there, editors, paranormal tour guides, psychics, ghost hunters, specialists and more! Big news for me! NCP has offered me three new contracts! Woo-Hoo! The contracts were offered on the sequel to I'll Be Yours, His Lady's Keeper, my futuristic paranormal fantasy, Psychic Chains, and my futuristic paranormal fantasy, Rogue Fairy book one in my new Exiles of Magic Series! More information, coming soon! Remember, you can subscribe to my newsletter author group, so you'll be the first to know of any new information concerning my books! My Yahoo Author Newsletter Group! I'm off to do some more happy dancing! 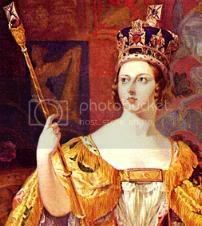 Happy Victoria Day Weekend to the Canadians reading my blog! I'm excited to announce that I have a new website, designed by the ultra talented Rae Monet! I'm so happy with this website it's definitely a dream come true! Here's the link to my site! This looks so good! I can't wait to see it! Jack is back! I have received a lovely review from a reader, who loved The Long Thin Veil. The review was posted at The Wild Rose Press. Admittedly, I do not read many stories of Faeries and veiled worlds where Leperchans and Nymphs come to life. This well crafted tale not only kept my interest but has me looking for more in a genre I've ignored. I look forward to more of Ms. Mathews stories. Thank you so much, Catherine! I'm so happy you enjoyed it and that I opened your eyes to a new sub-genre! Yay! Chatting Tonight with Gail Barrett at RWA Online! Join us tonight starting at 9PM EST and ending at 10PM EST as we chat with Harlequin author, Gail Barrett. 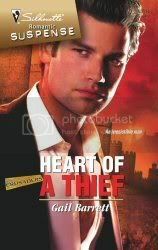 She'll be chatting about her latest release, Heart of a Thief! She'll be offering a signed copy of Heart of a Thief, so don't miss out! Follow the link below to reach our chat room! We'll see you there! 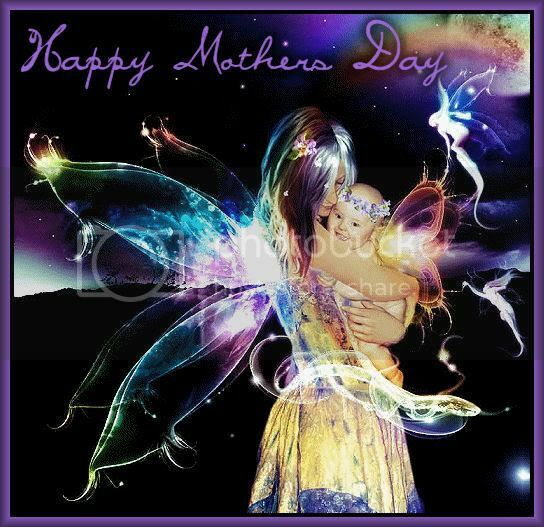 Happy Mothers day to all of you moms reading my blog! Author Interview at Chicks of Characterization Blog! Check it out! I've been interviewed by Andrea from Chicks of Characterization. Click the link below to go and read the interview! Don't forget to leave a comment so you'll be entered into a contest to win your choice of one of my available ebooks! 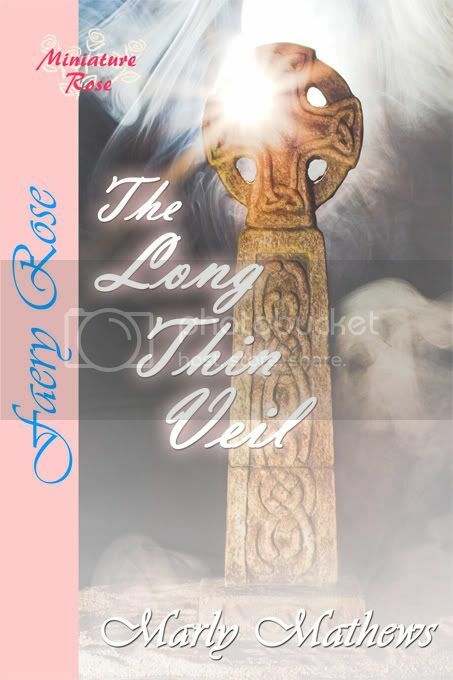 New Cover for The Long Thin Veil! Oh, yeah! Here's the new cover for my October 2006 release with The Wild Rose Press, The Long Thin Veil. :) I think it's a definite improvement from the previous one though that one was nice as well. Now, I have to get it updated on all of my sites! I'll include the blurb and buy link with it as well! 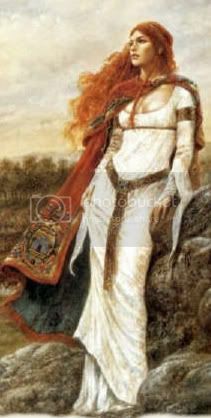 It is the night of All Hallow's Eve, in Scotland. Come nightfall, The Long Thin Veil between realms will slip away, unleashing the full magical power of Samhain. The spirits of the dead, faeries, elves and other otherworldly spirits will visit the human realm, and in return the humans may visit their realms. However, All Hallow's Eve comes with a price. While the spirits of the light are given access to our world, the spirits of darkness can also cross into our realm. Megan Rose MacLeod is a witch. She is the protector of her village in her family of witches, she is known as the 'chosen one'. Her time of reckoning is near, for she has made a bargain with a powerful man, Tiernan Fairlove, a man accustomed to getting what he wants. And, he wants Megan. Now, he must convince her that they are a match made in heaven, destined to be together for eternity. Blessings and danger abounds on All Hallow's Eve, in the end, their love might be the only thing that survives to see a new day. Review for Doorway to the Stars from Kasey's View! Here's what Kasey at Kasey's View had to say about Doorway to the Stars, I'll include the link to the full review at the bottom of this post. I found Doorway To The Stars to be a fascinating and thought provoking story that will linger in your mind long after the story is finished. In fact I think that this story could probably use a sequel! The characters are extremely likable, the world building is very interesting, and the chemistry between the two main characters, Aries and Freya is scorching hot... 4 Stars! Doorway to the Stars review! Thank you so much, Kasey! Reviews for Twilight's Kiss and The Promise!!! I have two new reviews for two different stories! The first review is for Twilight's Kiss my full length paranormal fantasy published with The Wild Rose Press. The second review is for The Promise my short paranormal Christmas Romance published with The Wild Rose Press! Kathy from Kathy's Review Corner read and reviewed both stories! Below is a snippet of the review for Twilight's Kiss! Thank you so much, Kathy! Twilight's Kiss was a paranormal story with so many elements - vampires, a curse, fairies and even elves. There is a large cast of characters that were fully developed, and that I worried about as the battle loomed. I adored the interaction between Sean and his several times removed niece Grace. She definitely kept him on his toes, and he adored her. The slow build up of the romance between Bridget and Sean was believable, especially considering Bridget thought all vampires should be destroyed, and Sean was uncertain whether Bridget was the answer to the prophecy. There were times that it felt as if the story jumped, and the ending does leave a couple unresolved storylines. Overall, I adored Twilight's Kiss and eagerly await what I hope will be a sequel or two. Below is a snippet of the review for The Promise! The Promise was a sweet romance of two people fighting the inexplicable forces that was drawing them together. Neither trusts the other, and both were resolved in finding out the truth of what was happening. As I'm learning to expect and enjoy from Ms Mathews, there was an extensive set of secondary characters that fully participated in the story. There were a couple decisions and assumptions made in the story that were abrupt, but overall, I can see definite promise for a successful future for this author. I'm running a contest until the 17th of May on my yahoo author loop for a free download of Twilight's Kiss. If you'd like to enter the contest, you'll need to join the group. Join my yahoo author group! 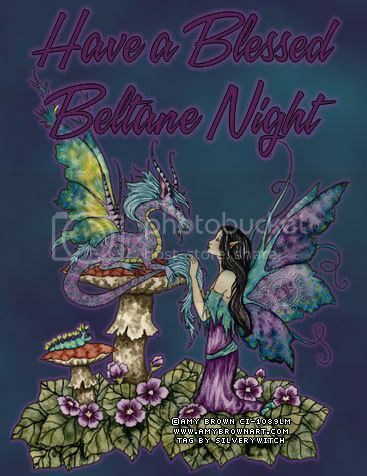 Happy Beltane! 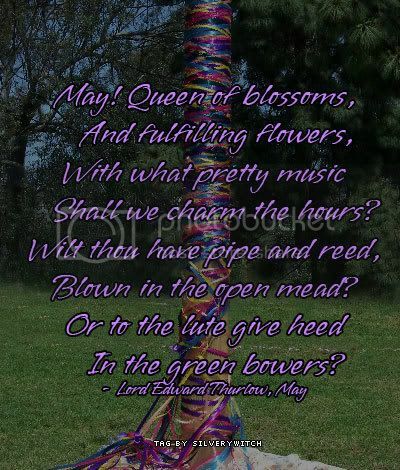 I'm happy to see the arrival of May, though I do like April as well. May is my birth month so it's always held a special place in my heart.